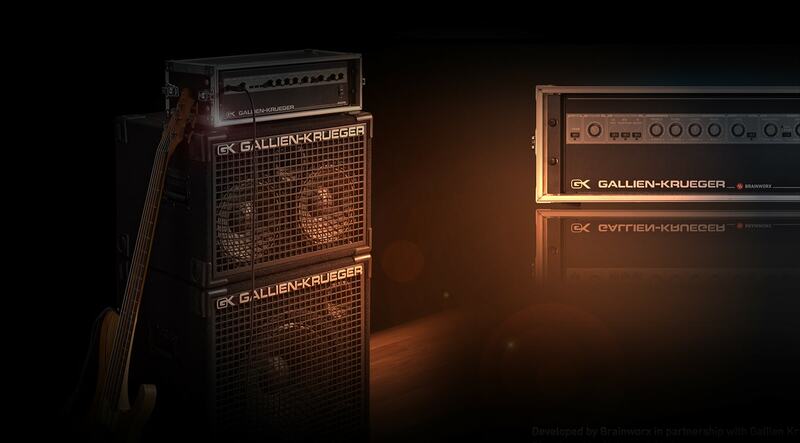 Like the original hardware, the Gallien‑Krueger 800RB Bass Amp plug‑in is a Swiss Army Knife of bass tone. GK's patented voicing filters offer instant access to classic EQ profiles in the low, mid, and high frequencies, and its 4‑band active EQ lets you dial in your ideal tone with precision and ease no matter what type of bass you play. The Gallien‑Krueger 800RB plug‑in emulates the original hardware’s bi‑amplified architecture, providing two different power amps ‑ one for the lows and one for the highs. An adjustable crossover allows you to control which frequencies go to which power amp, and each has a master volume knob, making it easy to dial in just the right amount of bass or bite. Harnessing UA’s groundbreaking Unison technology, the Gallien‑Krueger 800RB Bass Amplifier plug‑in gives you the impedance, gain staging, and circuit behaviors that have contributed to making this iconic tone machine one of the most recorded bass amps in history. Just drop the plug-in into the dedicated “UNISON+” insert in UA audio interface Console software. The Gallien‑Krueger 800RB plug-in features tools that greatly add to its versatility when tracking bass guitar. The FX Rack features an onboard noise gate, Power Soak, and EQ filter controls, allowing you to put the finishing touches ‑ before or after mixdown ‑ on your tones. But it’s the 800RB plug‑in’s 64 Recording Chain presets that give you the ultimate in flexibility. These presets give you endless combinations of vintage mics, cabinets, and outboard gear ‑ like having an engineer patching you through various chains. If you are recording a bass guitar with a DI-Box it´s very impressive to use the Gallien-Krueger 800 RB Plugin. Classic tone in a new easy to use format. I've owned the 800RB hardware for almost 20 years and this plugin is bang on. It lets me get the bass tone I've grown accustomed to without having to shake the foundations of my studio. This thing is a tone monster. So easy to dial in what you are after just like the real thing. My new goto amp for tracking bass on the apollo. Da un po' cercavo una emulazione che desse al suono del mio basso una svolta. Con questo plugin sono riuscito ad ottenere ciò di cui avevo bisogno. Non so dire se è fedele all'originale, sicuramente non delude. Grandissimi i ragazzi dell' universal audio. I didn't think that UAD could do any better than the Ampeg collection, but, personally, I think this tops those. I suppose it depends what sound you are looking for though as I do especially love the SVT-VR. good amp that sits well in the mix, many opportunities for good sound in different genres. Great plugin, it sounds just like the actual hardware. This will be my go 2 for quite some time. Really cuts through. Lots of definition and very much in your face. Very intuitive to use as well. I demoed it and waited for months for it to go on sale. When it did I nabbed it immediately! I have owned an original Gallien Krueger 800RB and have gigged extensively I really know what this sounds like and honestly i reckon this plugin is better. Sounds like the real thing. Nice solid bass tone when you don't want or need Ampeg attitude. Pretty versatile in it's own right. Recommended. Having played with the original unit for years, I have to say I am pretty happy with this plug. Combined with the Eden and the SVT Pro, it fulfills every last bit of bass guitar sound I want to accomplish. It doesn't necessarily sound like the head itself, it has a middle range that I find works well in rock program material with lots of synthesizers. The presets dial in the tight low end these units are known for. I think any bass player would be happy employing this on tracks. Sell your mother-in-law if you have to! WOW!! these guys do what they preach. Just get it. You will not be disappointed. Even my wife noticed the difference in bass sound. Reunited with a tone I used for years. My first serious bass head was a RB400 then an 800. So getting this tone back in bass recording was exciting to hear again as my old 800 needs to be repaired once I locate in the garage. This is one of my favorite bass amps moreso than ampeg. It’s nice to get that thumpy bright tone with the mid contour down. Throw the empirical lab distressor on it and look out!!! The base will insist quite strongly that this base amplifier exists. Sounds like I want to hand over the leading role seat to the base unexpectedly. Of course, the sound as a side supporting role can be expressed easily and firmly. It is a plug-in that seems to me that it was really good to buy it.